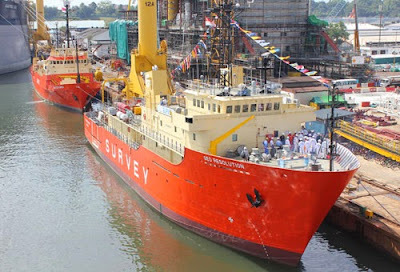 Purchased from the RNZN in October last year by earth sciences and surveying firm, EGS, the 68-metre vessel has been converted into a commercial hydrographic and geophysical survey ship since arriving at the shipyard from the Devonport Naval Base in early November. This has included the installation and commissioning of a full ocean-depth multi-beam system, state-of-the-art USBL system and geophysical sensors to carry out surveys down to a depth of 2,000 metres. Additionally, the geophysical equipment suite has been complemented by gravity coring facilities and an MCPT system for in-situ geotechnical and burial assessment survey work, while communications have been upgraded to include a V-Sat system to enable broadband Internet connections and high-speed ship-to-shore data transfers. Expressing gratitude to the RNZN for its assistance with the purchase and transition process, EGS chief executive Chris Welsh also complimented the Navy for having kept the vessel “extremely well maintained”. “This was an unique opportunity for EGS to acquire a vessel which was purpose-built as an acoustically very-quiet survey platform, ideally-suited in every way for the survey work we perform,” he said. Adorned in EGS’ red and yellow livery, the vessel was relaunched in a blessing ceremony attended by company management in Singapore before preparing for its first commercial contract. Ironically, this is in New Zealand where the ‘Geo Resolution’ will be performing survey work on a new submarine cable system spanning the Tasman. Originally designed and constructed in Mississippi for the United States Navy, where it was christened the USNS ‘Tenacious’, the vessel was the seventeenth of a Class of 18 Stalwart-class surveillance ships.